Victorian Vintage Musings: All of One and One For All! Costume Designers of the Musketeers! All of One and One For All! Costume Designers of the Musketeers! Not only am I drawn to and intrigued by handsome and dashing musketeers, but the creation of the costumes for each reincarnation of the Musketeers intrigues me.My plans for this blog was to showcase the iconic costume creations of The Three Musketeers and the emphasize the one unique item the costume designer created for their Musketeers. As I was researching the designers and hoping to find their inspiration for their costumes I discovered and was fascinated more by who the designers were themselves. Our only female designer in the list of amazing costume designers, Phoebe de Gaye has designed a wide range of period costumes - from the meticulous authenticity of The Forsythe Saga, another one of my favorite, to the fantasy of Sinbad - but she’s never had to face a challenge like The Musketeers. Drawing on both historical references and contemporary fashion, Phoebe evolved a style that combined romantic swagger and gritty realism. Leather boots, doublets, embossed armour. Hats that looked as though they’d been worn in rain and shine. Cloaks you really could sleep in. It was these cloaks that I felt were the shining star of this version of the musketeers. 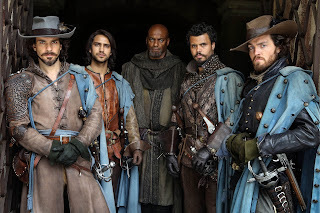 Yes the rest of the costumes for this serious are wonderful and I don't believe there has ever been sexier Musketeers, but the blue cloaks Phoebe designed are amazing. If any piece of clothing will become licensed to reproduce I hope it is this one! The women too were a tough proposition. Their costumes had to convey the sense of power and spectacle that made the stories so thrilling. They had to look feminine - but not fanciful. These weren’t going to be passively beautiful characters - trophies for the men to fight over - but strong, assertive figures who could take the men on at their own game - and win. From Constance, the love of D'Artagan, The Queen, and Lady DeWinter,if you are fans of the Musketeers on BBC America you know how strong these women are. The 1970's version is still my favorite. After reading the book a short time ago, I never realized how close the casting was on finding the characters to fit their roles. Michael York could not have fit the description any more than if Dumas was sitting across from him in a pub. 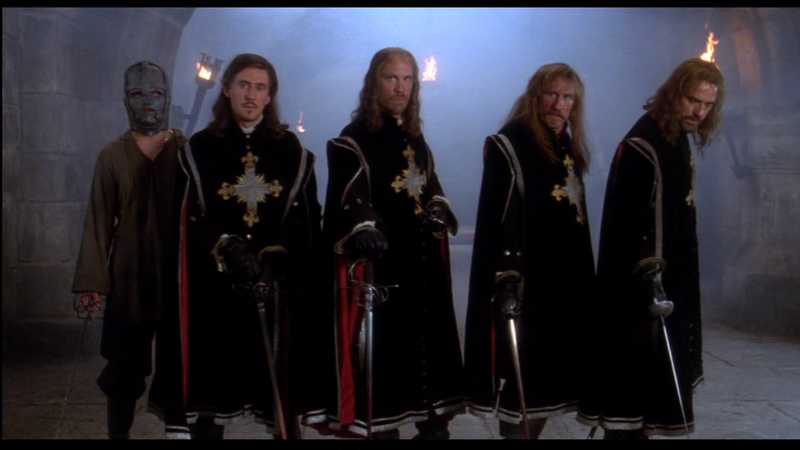 Some of the costumes in this version were a bit fantastical but non the less these musketeers were probably the most authentic. Created by Larry McQueen, who today is the owner of "The Collection,". For the last twenty-five years, Mr. McQueen and his late business partner, Bill Thomas, actively dealt in the field of important motion picture costumes, both in acquisition, sales and exhibitions. Respected as a leading Hollywood costume historian and archivist, McQueen has held the positions of consultants for Camden House Auctioneers, Inc. in Los Angeles; Christie's East, New York; Christie's London, Butterfield & Butterfield, Los Angeles/ San Francisco, Entertainment Rarities ; Julien Entertainment and has been responsible for the authentication of film costumes and the estimation of their value. Mr. McQueen's private collection of film costumes is one the finest private collections of its kind and consists of costumes worn in films from 1920 to present. His concern is with the preservation and restoration of these valuable art works and with sharing them with the public. He has exhibited portions of his collection in association with The Academy of Motion Picture Arts and Sciences, The Metropolitan Museum of Art in New York, The Los Angeles Museum of Art, The Victoria and Albert Museum in London, The Fashion Institute in New York, the American Film Institute, The Fashion Institute of Design Merchandizing in Los Angeles, Australian Center For The Moving Image in Melbourne, Australia, Museo Salvatore Ferragamo in Florence Italy, the Field Museum in Chicago, The South Carolina State Museum, The National Museum of Antiquities in The Netherlands, the Bendingo Museum in Autralia, The Dallas Women's Museum, The Oakland Museum of Art, The Columbus Museum of Art, the Oklahoma City Museum of Art, The Skirball Center in Los Angeles, the Museum of Biblical Art (MOBIA) in New York, the Fashion Foundation in Tokyo Japan, The Tropenmuseum-Amsterdam and the Kulturgeschichtliches Museum in Germany. The Last Story in the series know as the D'Artagnan Romances. Although a Disney creation, the crowing piece of costume brilliance were the Musketeer Tabards. 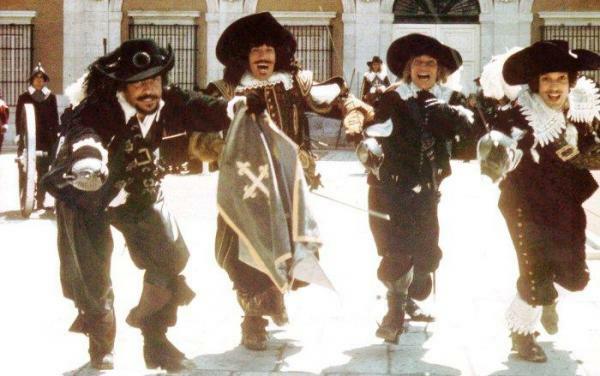 Possibly the most beautiful ever created for D'Artagnan, Athos, Porthos and Aramis. I was disappointed to find little information on James Acheson He was born in 1946, in Leicester England and got his start working on this silly little British series that no one has ever heard of, something by the name of "Doctor Who". "The ladies in the costume department at that time were all pink tulle. They didn't like fiberglass and rubber, so I got that job," he said. After that, Acheson ran away with the circus. "It was for a girlfriend," he said. "I was the stage manager for the Russian Circus on Ice that toured all over Spain." His first feature film credit came with "Time Bandits" in 1981. Two years later, he costumed another British pop-culture phenom: "Monty Python's The Meaning of Life." Acheson picked up his first Academy Award for Best Costume Design in 1988 for "The Last Emperor." For that sweeping epic, he crafted more than 10,500 costumes on a paltry $1.8 million budget. "We couldn't afford anything," he said. By comparison, "I can't tell you what my budget was for the last "Spider-Man" film but just one Spider-Man costume cost $22,000," and 42 of the suits were made for the third movie in that series. Disney did their best with this version. I must say Tim Kerry was the best Count Richleau ever and well as Michael Wincott as the one eyed Rochefort. The costumes fell short in my opinion compared to the previous, the designer created the costumes for a grander story of good vs evil-which is now owned also owned by Disney. Academy Award-winning costume designer John Mollo was born in London, England in 1931. As a boy, he displayed a passionate interest in the history, design, and evolution of European and American military uniforms, which formed the basis for a long and successful career in movies. He made his debut in costume design working on a little movie by little known director George Lucas. It was for his work in George Lucas's Star Wars (1977) (aka Star Wars Episode IV: A New Hope) for which he won his first of two Academy Awards. What a well researched piece!! 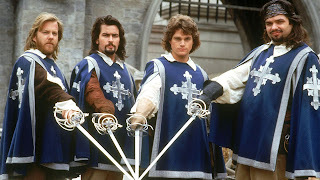 I LOVED The Three Musketeers-1973 movie. There were no videos that you could rent back then so I had to go to the theater if I wanted to see it again. I went 14 times!!! I have the soundtrack, too - in LP version! However, I love the BBC television version the best! !